Fancy yourselves a Dark Souls player? Check out the latest and greatest challenge build... The Scavenger! Click "Read More" for the full rule set. Hello everyone! Though it took me a week longer than expected (I didn't realize I had THAT little free time until just now...) I've had a chance to watch Shin Godzilla thanks to our friends at Funimation. It hits theaters in a week on October 11th, so I'll keep this as spoiler-free as possible while doing my best to get you hyped. First thing's first: It's good. This is a true throwback to the monster's original purpose, which was to be scary. This movie acts as if, essentially, Godzilla 54 never happened but is happening now in modern day. This world is seeing Godzilla for the first time and he is just hideous. I mean, look at those teeth. That weird grotesque tail. He's a monster in appearance all the way. The last time we even came close to him looking remotely scary was in Giant Monsters All Out Attack where the roles were reversed and he was the bad guy. Even then, I wanted to snuggle him. Not now though. He's riddled with radiation burns, open sores, a beady eye. Nope. Nope nope nope. I will say this: If your main complaint with 2014's U.S. release Godzilla was the monster's lack of screen time, then this may not be the kaiju movie for you. This is a movie about Japan's interpersonal conflict during a national crisis. A natural disaster movie with a focus on politics, international relations, and how unprepared we truly would be for something like this if it were to ever actually happen. So be ready. There's a lot of talking. Most of the movie is spent in meetings trying to figure out how to break through red tape, handle the monster, and deal with pressure from other nations. Luckily, the drama unfolding away from the monster is just as intense as the monster itself, and is never shallow. Every moment of Godzilla's screen time is incredible. He has a few phases and the design for each is great. He's actually pretty cute early on, but upon achieving full power he is a massive and towering force of destruction. A culmination of humanity's malice in a physical body. His signature fire breath attack is probably the best I've ever seen as well. It absolutely floored me when he finally went nuts with his laser light show of death. I hope he's added as DLC to the newest Godzilla game (the one everybody hated but it's still sweet so WHATEVER). 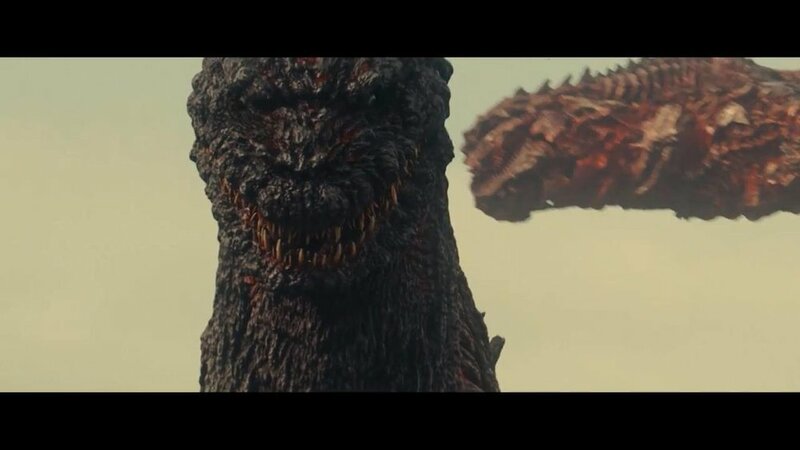 Maybe we'll be lucky and Atari will do another Destroy All Monsters: Melee style game and we'll really get to wreak some havoc with Shin Godzilla. It may be one of my favorite designs of our favorite monster. The effects in the movie are great. It's a combination of a suit with some digital/CGI enhancements. While a couple of brief scenes look a little wonky, most of it is done very well and it's a perfect way to keep that Godzilla feel while allowing them to do more. The music in the movie is also perfect, revisiting original classic Godzilla tracks in all their modern glory to fill us with a sense of ominous calamity as he makes his way across the land. Definitely two thumbs up for the soundtrack on this one. I want to talk more about him, his powers, his design, the movie in general and possible easter eggs - but I will save that for another day. This movie will be wonderful for theorists to pick apart and I can't wait for all of you to see it so we can have that discussion. Get out to your local theater on October 11th and see Shin Godzilla (Godzilla Resurgence). Trust me. It's good. Click here to learn more about It Came From Schenectady's showing of Shin Godzilla at Proctors Theater, and get your tickets today! January 1st to January 11th. We will Re-Open for business January 12th at 11AM. If you have a shopping emergency during that time, call the store and let us know and we will work with you to shop by appointment. We will be taking this time to get a couple of days rest before powering through any trade-ins we haven't caught up on, as well as count our inventory. Things at Forgotten Freshness have been crazy. With the amount of stuff coming in faster than we can inventory it, the road trips for buying and selling, and trying to manage the floor inventory, website inventory, and social media outlets all at once - our heads are spinning. The website inventory had been planned to be updated by mid-summer, but that fell through in interest of prioritizing. It is still being worked on periodically so ALWAYS CHECK BACK for new items. We try to add a handful every week (mostly in NES at the moment) to keep progress moving. Once we're caught up in-store, which is getting close I hope, I'll have more time to edit the site and upload more items for sale. On behalf of FF, we're sorry the webstore hasn't been all it can be yet, but our physical store location always comes first. Seriously. This thing is rare as can be. There's more copies of Stadium Events in player's hands than this bundle. We're currently accepting offers on it, with an auto-accept on an offer of at least $2,000. It will include the third spare figure as well. As always, thank you all for being part of our family at Forgotten Freshness. Going 10 years strong, we never forget your support. Thank you thank you thank you! Angry Video Game Nerd: The Movie now available! Follow the wild adventures of James Rolfe as he must overcome his fear of the worst game ever made to save his fans... and the world! Buy from our online store and get it shipped right to you, only $22 + shipping. Welp, this is it. The new website is up and ready to go. I'm still playing with features, and looking for input on it, so consider this the Beta. For now, the online store can be shopped (with the few titles available in it) and will be updated more well into January with it's own separate inventory of games. This inventory will be different from the physical store location. However, if you see something in the web inventory that is a "Unique" item (an item where an actual picture of it is used as opposed to a stock photo) and want to pick it up in-store, let me know and I will remove the online listing ASAP. This also works the other way, if you are not local and know we have something in the store you would like we can always add it to the online store for easy checkout and order tracking. Let me know what you think! If you've been to the old website, I really hope this is a vast improvement. It might not look the best, but it's definitely better than the late-90's neon-fest that was our old site. Enjoy! Hey everybody! If you haven't noticed by now, you're visiting our brand new website. It's December 15th at the time of this writing, and the site isn't live yet, but I think by the end of the day tomorrow or at the very latest Wednesday I can have this up and running (let's see if I can manage to stick to that). Expect updates about the store via the blog as well as discussions about your favorite games. I may even sneak a coupon or two in here now and then for those that read this thing regularly. Leave a comment and let me know what you think of the new site! I realize it's nothing super fancy, but remember: the old site was terrible and looked straight out of 1996.